If you’re going to invest in Bitcoin then you need to wrap your head around the fact that there’s an entire market of cryptocurrencies. In other words, there’s competition. As a result, this opens up opportunities for speculation and trading. There might be a short term play (or two) worth considering. Pretty easy to see that it’s up over 42%. Up about 5%. That’s pretty weak compared to Bitcoin. 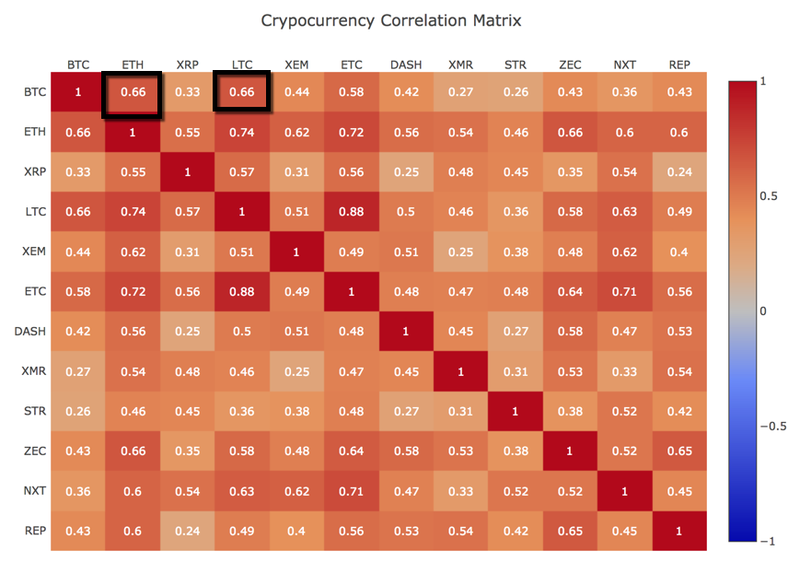 You can see that Ethereum (and LiteCoin) are 0.66 correlated with Bitcoin. The 0.66 correlation tells us that there is a strong albeit not 1:1 correlation between Bitcoin and Ethereum. In fact, they are all kind of “hot” and moving upward in price. So, we know that over the last 90 days Bitcoin [BTC] and Ethereum [ETH] have moved together but we also know from the price charts that Bitcoin moved “big time” compared to ETH; eight times as much in the last 30 days. A “fork” is a change to the software of the digital currency that creates two separate versions of the blockchain with a shared history. Forks can be temporary, lasting for a few minutes, or can be a permanent split in the network creating two separate versions of the blockchain. When this happens, two different digital currencies are also created. While many people think about Bitcoin as an investment or a currency, it’s important to remember that it’s also a technology. Yes, Bitcoin is software and it’s a network. Now, for some quick history, back on August 1, a hard fork of the Bitcoin blockchain created Bitcoin Cash [BCH]. Bitcoin Cash is worth about $470 right now and until the fork it didn’t even exist. In other words, since Bitcoin didn’t lose value and Bitcoin Cash was created out of thin air. Basically, you’re looking at free money. Yes, the fork created free money for most people holding Bitcoin. Therefore, it’s pretty obvious why everyone is so interested in holding regular Bitcoin again right now. With a new fork coming in late November, Bitcoin investors are hoping for another Bitcoin Cash to happen, where holders get the new token just for holding on to BTC. The Bitcoin Segwit2x fork is projected to take place on November 16th and will temporarily result in two bitcoin blockchains. Following the fork, Coinbase will continue referring to the current bitcoin blockchain as Bitcoin (BTC) and the forked blockchain as Bitcoin2x (B2X). Again, you don’t need to understand the technology perfectly here. What matters is that with history and experience from the Bitcoin Cash fork, investors are clearly loading up on Bitcoin. It’s hard to ignore what this is doing to the entire cryptocurrency market right now. Ethereum and Litecoin, for example, are barely moving up compared to Bitcoin. Given the normally high correlation of BTC to ETH, and BTC to LTC, this is quite clear to my eyes. Obviously, because of the flow to Bitcoin in anticipation of the fork, there are some opportunities. What trades work here? First, you might wish to invest in some Bitcoin in anticipation of the fork. There’s no guarantee that this will work out like Bitcoin Cash. But, it’s definitely an opportunity if you can tolerate the risk. Per the notes above, Coinbase is one place to invest to keep it simple. Clearly, they are responding to demand and they are keeping their community updated on the Bitcoin Segwit2x fork, and what that means for a new currency. So, that’s the first trade. It’s pretty simple and it’s something of a gamble based on previous fork history. It’s absolutely not meant to be sophisticated but it could pay a nice little dividend, of sorts. The second trade comes very shortly after the Bitcoin Segwit2x fork. Once that for happens in November, a relatively simple guess is that investors will turn their eyes to the alternatives. To keep things very clear, I’m talking about how fiat money (U.S. dollars for example) and Bitcoin will move into Ethereum and LiteCoin, as well as many other cryptocurrencies. The money that’s been pouring into Bitcoin will likely slow down a bit, but others like Ethereum and Litecoin will pick up steam. I generally don’t like trying to guess or use a crystal ball, but I feel like this is the right story. Bitcoin is getting extra benefits from the fork and Ethereum, Litecoin and the others are being suppressed a bit. Bitcoin is the big winner right now. However, once the fork happens, the pressure will then move sideways into other cryptos. Ethereum and Litecoin, for example, will start pushing up even faster. I wouldn’t be surprised if ETH and LTC grow 2-3x faster than BTC after the fork. Of course, all of this assumes that there’s no general cryptocurrency catastrophe (e.g., regulation). Stay safe out there.